The H7N9 virus is a “reassortant” — it includes combined elements from three distinct viruses. People acquire the virus mostly from exposure to infected poultry. As of today (January 29, 2013), the World Health Organization states that there is no evidence of sustained person-to-person spread of H7N9. No cases of H7N9 infection have been reported outside of China. Photo Credit: Centers for Disease Control and Prevention’s Public Health Image Library. During pandemics, which are caused by the worldwide spread of infectious microbes, different human populations respond differently to the infection, most likely because of specific differences in factors related to their immune system. Is this also true for the H7N9 virus? Should we expect differences in the susceptibility of different populations to infection? An international team of investigators from institutions in Australia, Singapore, the U.S. and the U.K. report, in an article recently published by the journal Proceedings of the National Academy of Sciences USA (January 21, 2014), that different human populations may indeed vary in their susceptibility to H7N9 infection. The article is titled “Preexisting CD8+ T-cell immunity to the novel H7N9 influenza A virus varies across ethnicities” and presents results related to several ethnic groups, including Caucasoid, North American natives, Oriental, African, Amerindian, Alaskan Yupik and Australian Aboriginals. Because H7N9 is a “new” virus, the immune system does not have memory of it and it is not ready to quickly produce neutralizing antibodies — which protect from infection or severe disease — when it encounters the virus. In absence of neutralizing antibodies, the human immune system relies mostly on a type of killer cells — called cytotoxic T lymphocytes — for protection against the virus. These lymphocytes kill cells infected with the virus along with the virus growing in them. However, cytotoxic T lymphocytes can kill infected cells only if viral peptides — short segments of the viral proteins — are bound, in the infected cells, to molecules called HLA. Many of the peptides from the H7N9 flu virus are very similar (“conserved”) to peptides from other flu viruses with which human populations have already been in contact, and cytotoxic T lymphocytes that “remember” these peptides are ready to kill cells infected by H7N9. There is a caveat, though. HLA molecules are present in the human population in a very large number of variants, and not all variants are able to bind the same peptides. Consequently, some human populations may not have HLA molecules that bind H7N9 peptides and, therefore, may not use quick-acting cytotoxic T lymphocytes to eliminate the virus. Results from the study show that Alaskan and Australian Indigenous people do not have HLA variants able to bind the “conserved” H7N9 peptides and, therefore, may be particularly vulnerable to H7N9 infection. “New viruses,” such as H7N9, particularly raise concerns because their capabilities are not yet known or fully understood. This virus is considered a reassortment, or the genetic material has been mixed into different varitations from a particular species, limiting the knowledge of its epidemiology and behavior (1). In my opinion, the best way to contain this virus is to locate the animal source, quarantine or eliminate it, and prevent any further purchase of the poultry until more is known of the virus. It was stated earlier that the virus induces different responses in different ethnicities. However, when reading the article the first question that arose in my mind was, “Does this virus affect females and males differently and are males or females more prone to attaining the virus?” I could not find any articles that observed biological differences in the response to the virus. However, according to ” Human infections with avian influenza A(H7N9) virus in China,” elderly men seemed to be the most affected, resulting in 20 percent deaths whereas no deaths were seen in females (2). I believe that this difference can be due to the differences in hormone distribution or it could be unrelated to hormones and simply be due to one group being more exposed than another. This added exposure may cause that group, males, in this case, to be more vulnerable. Hi everyone, this is a quick update on the status of the flu caused by H7N9 influenza virus. As of January 31, 2014, the total case of infection is 277 and unofficial death count is 61. The youngest patient is a 2 year-old boy whose parents have a duck farm.Considering this virus was first discovered on March 2013, these statistics are alarming. I think that this “new” strain, H7N9, is definitely a cause for concern. Now is the time to be worried and thinking about the “what ifs”, not when it mutates and is able to spread human to human. Like the Global Fool commented above, it only takes a few mutations before we could all be at risk. Scientists and researchers are doing the right thing by creating a vaccine for it now. The vaccine may not be much help however, if it is still in its early stages of being created. The article states that a large number of people are going to be visiting China for the Chinese New Year celebration. These are people from all over the world, including areas where people may not have the HLA molecules that bind the H7N9 peptides. These people get sick during their time there or soon after leaving from Chinese New Year and bring it back to their home countries or even the Winter Olympics (since that is starting in a few weeks). The disease mutates and is now spread person to person and we are all at risk. Now, my little example is probably a little theatrical but still possible and a reason why we should take this virus seriously. It’s not enough to say that those in China should stay away from poultry. That is pretty impossible. Different countries also have different laws in place regarding cleanliness and how animals are raised. The way a chicken is raised may not be as big of a deal for those living in China as it is here in America. As the person above me stated, right now it is best for the government to go around and teach proper safety techniques, washing hands, and inspecting the living areas of both the chickens and people raising them. The only thing we can do is keep a very watchful eye on what’s going on and try to be proactive before it gets serious. Just want to correct you about the largest human migration during Chinese New Year. Chinese New Year is just like the Christmas to western people. This is the holiday for Chinese people to go back home, stay with their big families and celebrate the coming new year. In China, a lot of people work, study or even live in different cities, but all go back to their hometown (where they were born or their parents live) for this holiday. Considered how big the population in China, it is so called the largest human migration. Therefore, back to the flu virus and the disease, it might be spread by this migration, but probably only within China not all over the world. Oh ok, sorry I was unaware that it was mainly people that lived in China that celebrated Chinese New Year or travelled to celebrate the holiday. Thanks for clearing me up on that. However, isn’t it possible that Chinese Americans may travel from America to China to celebrate with family that may be there. Also, even if the disease is spread throughout China, there still is a possibility that it could spread from a less populated area to a more populated place where tourists might visit and the disease could spread from there. The only point I’m trying to make is that China is a big place that gets a lot of tourists so someone visiting could easily become infected. For me, it is no surprise that flu virus has attacked China one more time. Like many Asia countries, getting a flu vaccine yearly is not considered a necessity for the major of the population. Instead taking a proper prevention, people only seek for treatment when the situation turns bad or lethal. By the time, it would be too late. Here is a true story: During the 20 years I lived in Asia before moving to the United States, I had never voluntarily got a flu shot. And I don’t think any of my friends did. As the article mentioned, vaccine helps by training your immune system with a new type of virus. So obviously, the immune system of the people who do not get flu vaccine yearly is less “armed” and therefore flu virus gains easier access to take control over. This reminds me of “herd immunity” concept where the more vaccinated individuals in a population, the less likely a susceptible individual will encounter the virus. As for many Asian families in the rural area, they like to raise chickens in their backyard to use as a food source. So the chickens mentioned above will never be inspected for bacteria or virus before getting eaten. This might be another reason leading to the higher rate of bird flu attack in these areas. I think it is very important to educate people in those countries on how to protect themselves first. At least, it is going to slower the spreading of flu virus while scientists are dealing with making new vaccine. Although this is a new virus, H7N9 seems to be a virus that can be contain due to the fact that it does not spread from person to person limiting the possibility of a pandemic happening. Also having the knowledge of where H7N9 originates from is an advantage in that we could isolate it and study it to build a vaccine against it. It is interesting to see how our body is able to recognize this new virus due to its similarity of having peptides like other flu viruses .Could it mean our immune system is evolving as well making itself even better ? It is an interesting thought. One thing that I wonder is if this virus is similar to H1N1 or if it is H1N1 but has evolved already and is not realize. This is interesting because according to an article written by Annie Rahilly-Melbourne the same case happen in 2009 when the H1N1 pandemic influenza outbreak happened. During that time 16 percent of Australians being Indigenous were hospitalized because they found that they also did not have HLA variants that could not bind to H1N1 peptides. Is there a connection somehow? Although this is a new virus it seems like H7N9 is a virus that can be contained to a certain degree.The fact that the WHO organization have found that it does not spread from person to person is indeed a good finding limiting that factor of there being a pandemic for now. Also knowing where the source of this disease comes from is also an advantage in that they can isolate this virus to build a vaccine against it before evolves and begins to spread person-to-person. It very interesting though that even though this is a new virus are body is able to recognize it due to the similarity of the peptides from other flu viruses and then kill it. Could it mean our immune system is evolving as well making it self even more better by finding a way to identify a new viruses by linking it to something it has previously killed or recognize.It is an interesting thought. One thing that is to be wonder as well, is if this virus is similar to H1N1 or if it is H1N1 but has evolve already and they do not realize it. This is interesting because according to an article written by Annie Rahilly-Melbourne the same case happen in 2009 when the H1N1 pandemic influenza outbreak happen when 16 percent of Australians being Indigenous were hospitalized because they found that they also did not have HLA variants that could not bind to H1N1 peptides. Is there a connection somehow? I agree with the two posts above as well. It is a little confusing that although the article states “there is no evidence of sustained person-to-person spread of H7N9”, but we are incredibly concerned about the pandemic potential of the virus. I understand the H7N9 has a high mortality rate, but if there is little person to person spreading the only concern I see for a pandemic is in regards to the poultry most cases are coming from. PR Newswire writes that the Sinovac Biotech has filed a vaccine with the Chinese Food and Drug Administration. I find this very significant because if the virus is being spread through poultry the China Food and Drug Administration should be the first on the case. The CFDA should be concerned with regulating the poultry quality. The need for a vaccine is there, but if we stop the transmission of the infection all together there could potentially be a larger impact. A vaccine for the Chinese people would help as well, although at this time I do not see a need for people of a country far from China to receive the vaccine. Flu viruses mutate extremely fast, and it just takes a few mutations to acquire the ability to go from human-to-human. This justifies the concern. If it mutates, and starts spreading from person to person, given the very high mortality rate associated with this virus, we will be heading to a disastrous pandemic. I agree with Aaron; it does not surprise me that the two ethnic groups that find themselves more isolated than the rest do not possess HLA variants with affinity for H7N9 peptides. Larger populations have a more diverse gene pool, and like other genes, HLA genes are inherited from parents to offspring. A mother and father with genes of HLA that do not overlap allow the child to generate more variants of the HLA molecules to be recognized by the cytotoxic T cells. Therefore, it makes sense that in smaller, more isolated populations, people have less diversity in HLA genes. Similarly, isolation of these populations may have contributed to the lack of need for HLA that can bind to H7N9 peptides, as they were probably not exposed to similar peptides from other flu viruses in the past. Pertaining to the flu vaccines, I know that outbreaks like these are monitored year-round to create a new flu shot to be administered annually. However, this year the vaccine protects against Influenza A (H1N1) viruses, influenza A (H3N2) viruses, and influenza B viruses. Two of these vaccines were present in the US and the other in Canada. It is likely the vaccine offered this season in the US does not offer protection against H7N9 because it has only been seen in China. 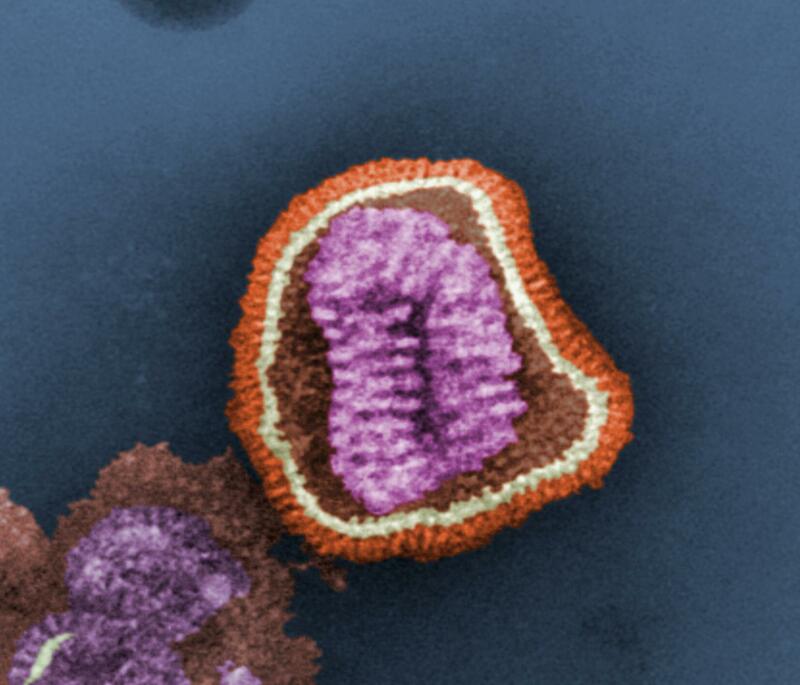 However, I wonder if H7N9 has similar virulence compared to the three viruses mentioned above. According to the first part of the post, the mortality rate is quite high for H7N9. The WHO website provides updated numbers – cases and deaths – day by day. Do you think the mortality is that high for the viruses currently circulating in the US? The CDC and WHO websites provide current, precise and reliable information to answer your question. May be you want to find the answer and provide it to all readers of this blog? The mortality is higher for the H7N9 than the viruses circulating in the US; few deaths occur from thousands of reported cases of the flu, while many of the few cases reported of H7N9 have ended in death. Every year, around this time, there is a “new virus” that could become a pandemic, but typically it does not. I’m not saying we should be completely unprepared, like Atlanta was for our little snowstorm, but if we take the necessary precautions to prevent the spread of a new flu variant we should be just fine. As stated in the original post, and first comment, as of yet there is no evidence of person to person transfer. The Times article states “Similarly, there has been only one family cluster of cases this winter, compared with four clusters last spring.” further detracting from the likelihood that it will transfer from person to person. Most people at some point in their life have had the flu, and many more have been vaccinated at some point. This adds a significant layer of defense because “Many of the peptides from the H7N9 flu virus are very similar (“conserved”) to peptides from other flu viruses with which human populations have already been in contact, and cytotoxic T lymphocytes that “remember” these peptides are ready to kill cells infected by H7N9.” What little concern there should be for the effects of this virus are for the relatively small populations mentioned that lack the HLA variant to bind to the conserved peptides, Alaskans and Native Australians. This is interesting, but not surprising as these are historically isolated populations. If we can successfully contain the outbreak there should be little to worry about. The Times reported only 188 reported cased of H7N9 since March of last year, but failed to mention if any more deaths had occurred. While this virus is re-emerging, this is still a very small portion of the global population. Even if the virus does manage to break out we have incredibly effective immune systems, even the populations of suspected greater vulnerability. While at first this may seem like a bad thing, but it may prove to be beneficial. It would result in the development of antibodies to fight future related flu variants, thus reducing susceptibility in the future. It is the immune system – or more specifically the inflammatory response – that caused so many deaths during the Spanish flu epidemic. Is the immune response all that is necessary to control the spread of infectious diseases in absence of vaccination? Of course we shouldn’t solely rely on our immune systems to defend against this virus. Basic precautions can be made to limit it’s reach. Simple hygiene such as hand washing is always a good start, but so far the only observed route of transmission is through contact with birds (chickens, ducks, and pigeons. To that effect people should limit their contact with birds. Those that do come in contact with birds should thoroughly wash afterward. People should also be sure to thoroughly cook any poultry they consume. On a larger scale we could cull bird populations known to be carrying H7N9. It would also be wise to isolate and monitor those that have contracted the virus. H7N9 could indeed accidentally come to America. The air travel time period is much shorter than the incubation period and if people start to get sick in North America it will be much more difficult to control and isolate. So the best bet would be for people to get the H7N9 vaccine. Independent Chinese scientists are in the process of creating this vaccine, so this vaccine has some trial to go through before it can be made public. This vaccine claims that it can keep up with the changing strains with the virus and is not getting additional help from the CDC or WHO. So for now it would be best for people in China to avoid coming in contact with infected poultry. What type of vaccine is this? Is this a H7N9 vaccine or is it being developed for other strains and so the hope is that would induce broadly protective responses? The researcher successfully isolated H7N9 from a throat swab and that virus was then put into embryonated chicken eggs. It is a H7N9 vaccine in the making to become public. Is this a killed, attenuated, recombinant vaccine? What type of vaccine? As of right now, different types of H7N9 vaccine are still on clinical trial and Chinese scientists have not announced which one would be used officially. However, according to an article dated October 2013 on Pubmed, for now they are trying to see if they can use H7N3 live attenuated vaccine as a substitute for the H7N9 vaccine. This is because these two strains of viruses have the same epitope on their hemagglutinin, a glycoprotein found on the envelope of influenza virus which aids viral attachment to host cell. The volunteers of this experiment showed the presence of antibodies for H7N9 virus after the administration of H7N3 vaccine. Nevertheless, further research need to be done before making a final decision.